The team at Cubiio has a dream that laser engraving can make the same leap that 3D printers have in the last ten years. Lasers are becoming more and more common in medical and manufacturing applications but the group wants personal laser cutters and engravers to be a popular item for makers and hobbyists. 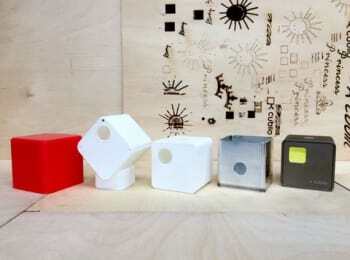 Cubiio is their compact laser engraver, currently running a successful Kickstarter campaign. The goals when developing Cubiio were simple - the team wanted an omnidirectional laser controlled by an app that could be used right out of the box. The app works with picture files, g-code, or text to program its path, then projects a weakened preview laser for the user to see where the laser will project onto the surface. Safety is baked into the design of Cubiio and a section of the campaign page is devoted to the safety measures in the system. Goggles are included with every package and the team recommends them to be worn every time the laser is used. Password is required for operation and an overheat function in the controller turns the laser off if the unit gets too hot. A three axis accelerometer detects motion and if the system falls over the laser will turn off. 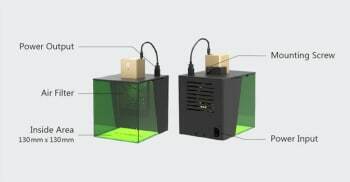 Finally, an extra CubiioShield option is available to hold the unit in a more traditional 3D printer enclosure to filter air and power the unit. The Cubiio unit is 50 millimeters on a side, and its working distance is between 150 and 160 millimeters. Working area is 100 millimeters squared. The OSRAM semiconductor blue laser has a lifetime estimate of 10,000 hours. When the CubiioShield is used the laser can be powered up to 800 milliWatts, outside of the enclosure the maximum is 500 milliWatts. The laser cuts with resolution between 152 and 254 dpi, and can move at a maximum speed of 2000 millimeters per minute. Laser certification is in process for IEC60825-1 and through the FDA CDRH. Cubiio has a good library of demo videos on its campaign page, and the fine print says they're all done with prototype units. There's a good section detailing the prototype stages that the product has been through since the idea phase in August 2016, and inspiring to think that the product design and development process can happen in under eighteen months. The campaign has blown by its funding goal and is well on its way to raising $1,000,000 before its September 20, 2017 end date. Basic models are expected to ship in March, 2018.